This hitch is awesome. I attach it to my 2016 Honda pilot with the anti rattle hitch and am able to put 5 large suitcases and some smaller items on back. This allows 6 passenger to travel with luggage. We have been as far away as Fort Lauderdale, FL (about 13 hours) traveling nonstop with no problems. This hitch is not my favorite because it is a bit hard to get locked in, but it does work great. 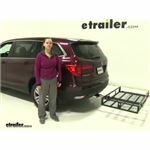 This is a great hitch and etrailer is a great company to purchase from. This is a very stout and well-designed cargo holder. I use mine on a Honda Pilot. There are two things of note to consider: The cargo holder sticks out very far from the back of the car. Because of that, I rigged my cargo holder with trailer lights. I highly recommend this and I wish it came with lights already installed. Secondly, as others have posted, the welds are definitely poorly applied. The product has an excellent design, but the quality control at the manufacturing point is unfortunately low. Nevertheless, this is still a very high-quality product. Great basic cargo carrier. Great value. We just went camping with it and it worked great. Very secure and felt very sturdy. We had no trouble traveling with it. We bought a bungee net (not included) to secure our three totes in it. Our totes are 18”x 24” and are 14” tall—they fit great with room left over, however, I would recommend purchasing one big fitted box for the carrier so that there isn’t wasted space. With our totes being 14 inches tall, the carrier still sits far enough away from the car that we were able to open the back door of our Honda Pilot without taking off the carrier or anything from it—so that was very handy when making pit stops to let our dog out and just to get stuff from the back. We have a large (85 lb) dog who was able to get in and out of the back of the car with the carrier still on (although a little tight). If you are traveling somewhere where theft is a concern, I would recommend purchasing a pin with a lock on it. Fun tip: We also used the carrier as a drying rack for towels after swimming and just as an extra table. It was nice being up off the ground. (This was just when we were parked at our camp site.) Enjoy! Bought this product to use with my 2014 Honda Pilot. Fit and worked perfect for us. Met all our needs. My husband is wheelchair bound and when we travel we have to carry a lot of different items with us. With this carrier we can even have others ride with us now. Very sturdy and had very little to no movement. I would highly recommend this product. Hi- I have just mounted the Rola Roof Cargo Basket on the roof of my Honda Pilot. I have to say it looks fantastic. Assembly was essentially very easy (though I wish I had some rubber safe lubricant available at the time [ my error- the instructions clearly stated to use some] ). Mounting it on the roof bars was incredibly easy and the mounting mechanism is intuitive and yet appears really secure. It is a good size, looks fabulous and seems really strong. As it was cheaper than some of the more established brands, I was a little concerned about how it might look- but absolutely no worries there. It worked perfectly on 2015 Honda Pilot. I have nothing but praise for this product. It’s still on my SUV and looks great. Thank you! After a good amount of research on cargo carriers, I settled on the Curt C18152. One year later, I couldn't be more convinced that I made the right decision. This carrier is rock solid. No swaying or bending like I see on the roads with other products. I love the carrier and couldnt be more pleased. Its heavy-duty and does not sway like so many that I see on the road. I have yet to haul a deer in it, which is what I had in mind when I purchased it. Hopefully that changes in the coming days. I have loaded it up with multiple coolers and other items, packing a lot of weight. It performed beautifully. Probably the smartest heavier duty carrier I've seen and used. Structurally sound, durable and convenient to use & store when not needed. A far superior product in looks and functionality than any I have seen or experienced through friends or family. A purchase I am more than happy that I made. I would highly recommend this product to anyone. sturdy product. etrailer deliver it fast/ontime. i would purchase here again! they also provided timely updates on delivery. I purchased this item due to its lighter carry weight as I will store it in an attic when not in use. Reasonably light considering the capacity. When I inventoried the fasteners included for assembly against the instruction sheet, the quantities appeared short. I decided to assemble what I could and then contact the company with what was missing. It all worked out and seems the instructions are for multiple models of similar design. Unit is stout and well made. Assembly was easy over a large cup of coffee. The carrier worked great. I purchased a large nylon cargo bag that not only kept stuff clean and dry it gave added peace of mind to ensure my stuff stayed put. I found a license plate holder that I attached to the bottom so when folded up I could move my plate from the rear side of the tray to the bottom mount quickly by using wing nuts. I looped two ratchet tie down straps around the base of each rear door shock and then hooked them to the the outside corners of the tray to keep it from sagging and wobbling. The straps also gave peace of mind when hitting bumps in the road that would otherwise make me cringe thinking it would reduce the stress on the unit overall. I recommend padding if you are using a cargo bag to prevent the metal from wearing on the bag. The downside of not using the turtle roof cargo carrier is that having stuff easily accessible from the ground means you have to be more vigilant about security when stopping to eat. We did not not over night anywhere but had we I probably would have taken all my stuff off the tray and into the room which is something you might not have to do with a lockable rooftop carrier. But for day trips to the beach you cant beat the value bc it is close to the ground and keeps all the sandydirty stuff outside and or off your roof rack. This is by far the best hitch mounted cargo carrier I have ever seen. It is well made with quality components. Took it on a 750+ mile road trip right out of the box and performance was flawless. Just rock solid with absolutely no vibration. eTrailer always delivered. I ordered it on a Friday and it was delivered on Tuesday ... astonishingly fast for an item that ways close to 70 pounds. 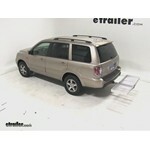 eTrailer is the ABSOLUTE BEST on-line retailer ... HANDS DOWN!! Its doing great ... we love it. Weve used it many times and its always good. The only downside is storage as it is big, but thats what you get. I needed this product to carry four peoples' luggage during a roundtrip drive from Virginia to Florida over New Year. I fit very will in the back of my pickup and held more luggage than I had anticipated. The zippers were a bit stiff, especially in the bitter cold we experienced, but otherwise was great. The straps worked very easily with the tie down points in the bed of the truck but I really didn't need to use them because of the weight of the luggage. For the price and its utility, it was the best product I could imagine. It will certainly be used again in the future and it will be interesting to see how long it holds up. This luggage bag far exceeded our expectations. We have been traveling with it for about a year now (including a 3 month journey across the US and through Canada). It was more than enough to fit everything our family of 5 needed on top of our minivan, and has survived countless storms (both with rain and even hail at times), and has never once lost its waterproof quality. All items put inside stay completely dry! We plan on not only using this luggage bag for as long as we possibly can, but if for some reason it ever does need to be replaced, we will immediately get another one just like it! I would recommend this to anyone and everyone! One of the best investments I've ever made! Recieved it today. Had it put together in 30 minutes now cant wait to use it. Definitely sturdy and well built. Will handle all the kid stuff just fine. Extremely Happy The amount of storage capacity, and ease of use with this product is outstanding. Having this has enabled us to use the back of our SUV for the dogs and we have never run out of space yet. Easy to assemble, easy to use, kept our luggage dry in a snow storm, we are very happy we purchased this. We would however suggest getting the locking thule hitch pin, the bolt that comes with it works but you can't lock it and prevent theft of the whole unit without the lock. I LOVE MY CARPOD!! We (my 3 kids and parents) took my Pilot to a 3 week road trip across 8 states, crossed the border to Canada including two provinces, and drove 4900 miles! This product held 5 duffel bags, 1 luggage, and other things we could stuff in there!! It rained the WHOLE state of Montana and only one side of inside the bag was wet. I think it was because I didn’t fold the flap down properly so some moisture seeped through the zipper and the sides of my girls’ duffel bags got wet. Tammy, the sales rep, was so helpful! I had many questions and she took time finding out the answers to my questions and helped me decide which product was best for me. She also suggested the anti rattle device, which I highly recommend, since I drove and felt like there was nothing behind me. It was so quiet!! It also made a prefect table for our roadside lunch breaks! I highly reccomned this product!! I just got the cargo carrier yesterday and installed it last night. Haven't taken it out on the road yet, but so far it looks and feels great and the anti-rattle locking pin keeps it nice and snug on my Hyundai Santa Fe. One comment. The description says that the distance from the center pin to the rise is 2.5". Not true on my carrier. It's 6", making the extender I bought completely unnecessary. Great product. I installed it on my 2018 Lincoln Navigator with no problem. Took about 15 minutes start to finish. Mounts directly to the factory OEM rack. I just used it to haul 5 pairs of skis, ski boots and two large luggage bags... it still had some room to spare! Let me tell you, I read many of the reviews saying how fast delivery was. Well, it was VERY fast!! I received my package in 3 days. Very easy to figure out how to put together and easy to build with the proper tools on hand. Attached it to my 2013 Honda Pilot that same night and it fits perfect. Its well above the exhaust and I can open my rear door with not problem. Very nice product. Sturdy and made of quality material. The assembly instructions are not the best, but I'm more interested in the product itself which is excellent. As a point of information, the top piece looks symmetrical, but be careful as it is not. Orienting it correctly will put the orientation such that on the rear ends there will be two holes on the left end and two holes on the right end to insert the reflectors. If you are 180 degrees out of sync, their will be only one hole at these ends and the reflectors will not assemble - anyhow a word-to-the wise! 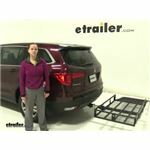 :-) In addition to the quality, etrailer packs fast and ships fast - great company to do business with. Just got back from two week trip and the carrier did great. Easy to install. I purchased this carrier because it did not have any of the complaints that I saw about other carriers that cost a bit less. I plan to use it for a snowblower, a walk behind leaf blower, and other large equipment. Took about an hour to assemble, and at least half of that was just learning the product. It is an excellent product and worth the money. All of the holes are drilled properly, and the quality is superb. I was able to put it Into the hitch alone by putting it into the vertical position and then lifting it up to the hitch on a 2016 Honda Pilot. Loading a snowblower was a breeze. No significant sagging of the carrier, about one inch with 200 lbs on it. The longer 48" ramp, as opposed to the standard 42" ramp, makes it possible to pull a 200 lb snowblower onto the carrier from the side without even going up onto the carrier. No problem driving at all. The instructions were clear. The anti-wiggle device works well. Any wiggle in the carrier was eliminated by tightening up the bolts on the hitch pivot piece as needed. The carrier pays for itself in one year by avoiding the service cost of pick up and return of heavy equipment like a snowblower, leaf blower, power washer or generator. Plus now I can take the equipment to my daughter's house to help out. Very happy with the purchase of this quality product. Our daughter lives in a duplex that she has to maintain, including snow removal. My husband selected this hitch carrier (the MaxxTow 30x50 Carrier) to haul our snow blower to help her out. He is very pleased by how sturdy and well made it is. It will mount perfectly on our vehicle. I called in so we could ask questions. Donna was so helpful with questions, placing and verifying our order. An added bonus was the sale price and no shipping fee! I am sure my husband will find other uses. Definitely recommend this product and etrailer.com. Worked exactly as advertised for a 300 lb load on the back of a Honda Pilot. Pretty easy to put together. The ramp is the best selling point. Quick and easy to assemble. Solid product. Perfect size and functionality for carrying and deploying a snow blower to go clear walkways and driveways at some family houses. it's been great and easy to use. I've used 4 or 5 times the past year for long road trips. Only complaint is that the sun will fade the black paint quickly. However, still very useful product. Being an old fabricator and welder I'm always a little skeptical about buying something like this that is manufactured. But I will say this exceeded all my expectations for fit and finish. The 3 pieces aligned perfectly together, and the mounting system was simple and secure. I mounted onto my GMC Yukon. Just for an added touch I mounted a 22 inch LED light bar onto the front faring which looks really cool. Have had the cargo carrier for a year and love it. I gave it 4 stars, but it should probably be about 4.5. The only reason I didn't give it 5 stars is because it is a little awkward to load as the support arms for the lid are a bit wonky. But once you get them into the locked position, they are fine. Have gone through a couple rainstorms and have had no leaks. Still, I always put everything in there in a plastic trashbag, just in case. All in all, I am very pleased with the product. I USED THE PRODUCT THIS LAST LABORDAY WEEKEND . DROVE CLOSE TO A 1000 MILES WITH IT STRAPPED TO THE TOP OF A HONDA PILOT. HAD NO PROBLEMS AT ALL. PRODUCT WORKED GREAT. I like the way the bag rests low when its not completely full & it's easy to expand by unzipping the expansion zipper if I need to haul more gear. My brother liked it enough to purchase one himself. This served me well on a cross country trip. I did my research on size and quality and thought this would fit my needs. Quality is good. Lock and latches work well. It seems a little flimsy when opening and closing but that is because it is so light. Once closed I didn't find any problems. I haven't used it much since the move but kept it on the SUV for several weeks after the move till I made room to store it in the garage. I would recommend it. Used for a cross country family road trip and it worked great. They just need a good method for storing it in between trips and perhaps rubber corners so it doesn't get scratched on the ground preparing to mount it on your car. Today we have a 2019 Honda Pilot. 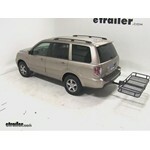 We're going to test fitting the etrailer.com tilting cargo carrier, which is part number E98874. 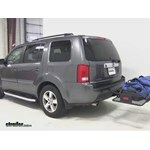 Now, this cargo carrier is a great accessory to have so that you can, if you don't have anymore space inside your vehicle for any type of cargo, luggage or any other gear, you can haul it on your cargo carrier outside of your vehicle. The cargo carrier is going to have a 500-pound weight capacity, which is pretty standard for most cargo carriers.As far as space, from inside rail to inside rail on the the length which is going to be the longer part from this side to here, going to have 60 inches, which is five feet. Then on the width, between these two, you're going to have 24 inches, so about two feet. Five feet by two feet. Today on our 2016 Honda Pilot we're going to be test fitting the Let's Go Aero 48 x 24 Big Boss Cargo Carrier for two 2" hitches. This has a carrying capacity of 300 pounds, and its Part Number is H01465. We already have it installed on our vehicle. Let's take a closer look at it. This is ideal for carrying a wide variety of items that you don't want to keep inside your vehicle, such as your coolers, your camper gear or some sporting goods equipment as well. There are bags and cargo nets sold separately or offered in kits with this part number as well. You can see around the edge here that we have several tie-down points for your ratchet straps or your bungee cords, and at the end here it has this reflective tape on either side. This is for better visibility while you're driving at night. Let's go ahead and give you a couple measurements here. Today on our 2016 Honda Pilot we're doing a test fit of the MaxxTow 30 by 50 wheelchair with 60"-long ramp. That part number is MT70260. Now this is designed to work with 2" hitches only and has a 500 pound weight capacity. We have it here in our first position. We have four other positions we're going to show you. Starting off with this one, this is going to be whenever we're loading up our gear, whether that's a lawnmower or a wheelchair or scooter. Today on our 2016 Honda Pilot we're doing a test fit of the MaxxTow 30 by 50 wheelchair carrier with 48"-long ramp. That part number is MT70106. Now this is designed to work with 2" hitches and has a 500 pound weight capacity. We have it one of our four positions. We'll show you how to do those others next. This one's going to be whenever you're loading up your gear, whether that's a lawnmower or an actual wheelchair or scooter. Today on our 2016 Honda Pilot we're doing a test fit of the CURT 24 by 60 cargo carrier. That part number is C18152. Now this is designed to work with 2" hitches only and has a 500 pound weight capacity. First thing we're going to do is take a few measurements, starting off with our ground clearance. We're going to have about 15-3/4". Overall to our vehicle we've got about 33". Today on our 2016 Honda Pilot we're doing a test fit of the CURT roof-mounted cargo basket. That part number is C18115. Now this is 41-1/2" long by 37" wide by 4" deep. It has a 150 pound weight capacity. You do with check with your vehicle's owner's manual to make sure it can withstand that much weight. Now we already have three of our four mounts secured down. Today on our 2016 Honda Pilot we're doing a test fit of the Rhino-Rack roof-mounted cargo basket. That part number is RMCB. Now this is 47" long by 35" wide and has a 160 pound weight capacity. We already have three of our four mounts secured down. We're going to show you our last one at the back here. We're just going to grab all of our tools. Today on our 2016 Honda Pilot we're doing a test fit of the Thule Canyon XT roof cargo basket. That part number is TH859XT. Now this is 49" long by 40" wide by 6" deep, and has a 150 pound weight capacity. We already have three of our four mounts in place. We've got our brackets in place as well. We're going to show you how to secure the back bracket onto our crossbar. Today on this 2016 Honda Pilot, we're going to be test fitting the 23x60 Strongbird Carlson Cargo Carrier, part number CC-100. This cargo carrier has a 500 pound carrying capacity, has this nice mesh floor here, which is going to make it a lot easier to clean. Plus, around the border of it we have these points here which are going to serve as tie down points for either your ratchet straps or your bungee cords, whatever you use to secure your gear. Next I'm going to go ahead and give you some measurements here. The first is going to be how much distance is added to the vehicle once the cargo carrier is installed. I'm going to go ahead and measure from the bumper since that's the farthest point out. From this point here, that's about 27", ground clearance looks like 10.5", then our closest point here is about 4.25". Today on this 2016 Honda Pilot, we're going to be test fitting the forty-eight by twenty-one MaxxTow Cargo Carrier, part number MT70422. Now this cargo carrier has a five-hundred pound carrying capacity. It's made from a strong, sturdy aluminum, and on the front and rear of it, we have these tie-down points here for your ratchet straps or your bungee cords, whatever you use to tie down your gear. I'm going to go ahead and give you some measurements now. The first is going to be the distance added to the vehicle once the cargo carrier is installed. Now I'm going to go ahead and measure from the bumper, since that's the furthest point out. So from this rail here, it looks to be about twenty-six and a half inches. For ground clearance, it's going to be around eleven inches. Today on this 2016 Honda Pilot we're going to be test fitting the 20x60 Curt Cargo Carrier, part number C18151. This cargo carrier has a 500 pound carrying capacity plus it has this nice mesh floor here which makes it much easier to clean. It has this rail all the way around the cargo carrier which is going to serve as a tie down point for your ratchet straps, your bungee cords, whatever you use to keep your gear secure while you drive. Now I'm going to go ahead and give you a couple of measurements. The first one is going to be how much distance is added to the vehicle once the cargo carrier is installed. I'm going to go ahead and measure from the bumper, because that's the furthest point out and so this rail here is about 33.25". Today on this 2016 Honda Pilot, we're going to be test fitting the 20 by 60 Curt Cargo Carrier, part number C18150. This has a weight capacity of 500 pounds and it has this nice mesh floor here which is going to make it a lot easier to clean. It also has this rail all the way around the cargo carrier which actually can serve as a tie down point for either your ratchet straps or your bungee cords, whatever you use to tie down your gear. Next, I'm going to go ahead and give you a couple measurements. The first is going to be how much distance is added to the vehicle once the cargo carrier is installed. I'm going to go ahead and measure from the bumpers since that's the furthest point out. This rail here, that's about 28 and a quarter inches. For our ground clearance, it's going to be about 14 inches. Today on this 2016 Honda Pilot, we're going to be test fitting the 20 by 48 CURT Cargo Carrier, part number C18110. Now, this cargo carrier has a 300 pound carrying capacity. It has a nice mesh floor here, which makes and much easier to clean. Around the border of the cargo carrier, we have tie down points, that you can use for your ratchet straps, or your bungee cords, what ever you use to strap down your cargo as you drive. Next I'm going to go ahead and give you a couple measurements. The first is going to be the distance added to the vehicle once the cargo carrier is installed. I'm going to go ahead and measure from the bumper, since that's the furthest point out. 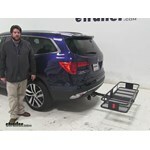 Today on our 2013 Honda Pilot, well be test fitting the Curt 24 x 60 folding cargo carrier, part number c18132. To install the carrier slide the shank into the opening of the hitch tube and align the pin holes, slide the pin through the pin holes and secure with a safety clip. Now lets go over some clearance measurements to see how the cargo carrier and the vehicle fit together, with the cargo carrier folded up there is about 8-1/2 inches of ground clearance, the closet part of the carrier to the closet part of the vehicle is about two inches with the cargo carrier folded up. With the cargo carrier folded down we have about 23-1/2 inches of ground clearance from the rear of the carrier, the closet part of the carrier to the closet part of the vehicles exhaust tip is about 22 inches, the cargo door extends over the base of the cargo carrier at about 20 inches and that concludes todays test fit for the Curt 24 x 60 folding cargo carrier, part number c18132 on this 2013 Honda Pilot. 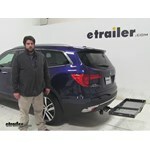 Today on our 2013 Honda Pilot well be test fitting the Curt 20 by 48 cargo carrier, part number C18145. To install slide the shank into the opening of the hitch tube and align the threaded pin holes. Thread the anti-rattle bolt through the threaded pin hole and tighten with a wrench. Now lets go over some clearance measurements to see how the cargo carrier and the vehicle fit together. Theres about 18 inches of ground clearance from the back of the carrier. The closest part of the carrier to the closest part of the vehicle is about 5 inch. 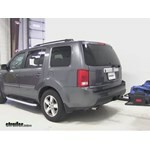 Today on our 2011 Honda Pilot, we're going to be doing a test fit on the Sport Rack Vista Cargo Carrier. Now this is the folding model. It's going to have a 20 inch depth by 60 inches in width. The part number on it is SR9851. This is going to offer us a 500 pound weight capacity and as you can see here it has been designed for use with 2 inch hitches. We've got 200 pounds that we've loaded up just to give you an idea of the stability of it. 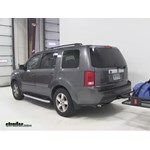 Today on our 2011 Honda Pilot we're going to be taking a look at the Sport Rack Vista cargo carrier. This is going to measure 20" deep by 60" wide. The part number on it is SR9849. As you can see, we've got 100 pounds of weight that we've put on here just to give you an idea of the stability and the security you'll have with your load. It's held in place using an anti-rattle bolt so it's really going to take a lot of the play and the movement out of here as we're traveling, which is going to give you a more stable ride for your items. Let's get this out of the way. That will give us a better look at the floor. 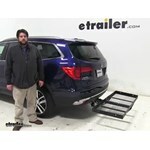 Today on our 2011 Honda Pilot we're going to be take a look at the K2 Detail folding hitch cargo carrier. This measures 20" across, 60" wide. The part number on it is K2HCC602. We've got it loaded with a hundred pounds just so you can see what the stability will be like. 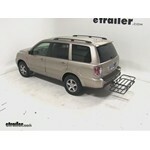 As with any cargo carrier secured the vehicle just using a pin and clip, you'll have a little bit of movement there. Nothing to be too worried about. 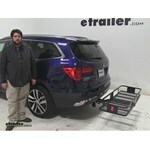 Today on our 2011 Honda Pilot, we're going to be taking a look at the Curt 24 by 60 folding cargo carrier. This is all going to offer a weight capacity of 500 pounds. Part number is a C18153. Now we just loaded it down with 100 pounds to give you an idea of kind of the stability it's going to offer. With any cargo carrier that's secured to the vehicle with just a pin and clip, you're going to have some movement. We've got some anti-rattle and anti-wobble devices available for that on our website, if you would like. Today we have with us the 2007 Honda Pilot. 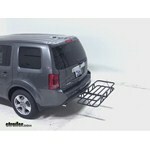 Well be test fitting UWSs 23 inch by 51 inch aluminum cargo carrier part number uws03511. To mount the cargo carrier to our vehicle well insert the shank of the carrier into the receiver tube of our vehicle. Well line up the hitch pin holes, and insert our hitch pin securing it with a clip on the other side. Once weve done that our cargo carrier is installed and ready to load up. Next well go over some clearance measurements. Today we have with us a 2007 Honda Pilot. Well be test fitting Surcos 24 inch by 60 inch folding cargo carrier part number 52018f. To mount this carrier to our vehicle well insert the shank of the carrier into the receiver tube of our hitch. Well line up the hitch pin holes, feed our pin through and secure it with a clip. Now well check for some clearance measurements while we have the cargo carrier still folded up. From the closest point of our carrier to the furthest point of our bumper measures about two and a half inches of clearance. 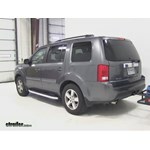 Today we have 2007 Honda Pilot. Well be test fitting Curts 20 inch by 60 inch folding aluminum cargo carrier part number c18100. To mount this carrier to our vehicle well insert the shank of the carrier into the receiver tube of our hitch on the pilot. Well line up the hitch pin holes, feed our pin through and secure it with a clip. Now well go ahead and take a couple of clearance measurements. Weve got about one inch of clearance between the furthest part of our vehicle and the closest point of the carrier. Today we have with us a 2007 Honda Pilot. Were going to be test fitting Curts 20 inch by 48 inch cargo carrier, part number c18145. To mount our cargo carrier to our vehicle well insert the shank of the carrier into the receiver tube of the hitch on the Pilot. Well line up the hitch pin holes, thread in our anti rattle bolt and well tighten it down with a three quarter inch wrench finally securing it with a clip on the other side. Now well go over some clearance measurements. Weve got about two and three quarter inches clearance from the furthest part of our vehicle to the closest part of the carrier. The SportRack cargo box # SR7016 will fit most factory roof racks with a minimum crossbar spread of 23-5/8 inches. The crossbar spread is measured from the center of the front crossbar to the center of the rear crossbar. Also, the crossbars cannot be wider than 3-1/4 inches. If your crossbars meet the above requirements then the box will fit. Will Thule Force Large Rooftop Cargo Box Interfere With Hatch Opening on 2017 Honda Pilot? In order to determine if the Thule Force XT Rooftop Cargo Box # TH6357B will interfere with the opening of the hatch on your 2017 Honda Pilot you only need to take a quick measurement from the center of your front crossbar to the seam where your hatch opens. If you have at least 47-1/2 inches then the Force XT will not interfere with the opening of the hatch. The SportRack SkyLine XL Cargo Box, part # SR7095 is a fit for your 2016 Pilot. I confirmed this with my contact at SportRack. This is an 18-cubic foot carrier and it measures 54-inches long x 39-inches wide x 19-1/2-inches tall, and has a weight capacity of 110-lbs. Yes, the license plate bracket of the Thule Transporter Combi Hitch Mounted Enclosed Cargo Carrier # TH665C that you referenced does have a light on it to illuminate the license plate. If you check you the picture I attached I pointed out the lens of the light with a red arrow. Will Thule Force XXL Rooftop Cargo Box fit on a 2016 Honda Pilot? To ensure there will not be any contact between your 2016 Honda Pilot's open rear hatch and the Thule Force XT Rooftop Cargo Box # TH6358B, you will need to take a quick measurement. If possible, adjust the roof rack's crossbars as far forward as possible, and measure from the center of the crossbar to the closest part of the hatch when it is opened. If it measures 51-1/8 inches or more, there will not be any contact between the hatch and cargo box. 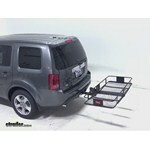 If you want just a regular hitch pin and clip you can use # PC3 with the Curt cargo carrier # C18153. If you want a locking option I recommend the anti-rattle hitch lock # 63232 which will help with stability as well as deter theft. If you have Rhino-Rack basket # RMCB then the internal dimensions are 41 inches by 30-1/2 inches. We have a couple of bags that will fit those dimensions better than the other bags. The smaller of the 2 is # RL100S50 which is 36" x 30" x 16" and 9 cubic feet of space. The larger one is # RL100S10 which is 38" x 34" x 19" so it would need to be tucked in a little. But it offers more space at 15 cubic feet. 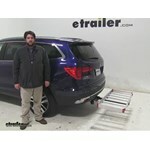 The ramp on MaxxTow cargo carrier # MT70275 can be removed with regular hand tools. It isn't difficult but would require tools. This is the case with all the carriers with ramps. None of them are particularly difficult but they do all require tools to remove the ramps such as box end wrenches or crescent wrenches. 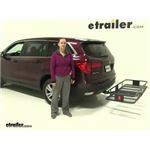 A great hitch mounted cargo carrier for your 2015 Honda Pilot is the 20x48 Curt Cargo Carrier # C18110. This carrier measures 20 x 48 inches and will hold up to 300 lbs. The shank has a 3-3/4 inch rise giving you ground clearance. It is made of steel and has a black powder coated, corrosion-resistant finish. I've attached a video of the carrier on a 2016 Pilot so you can get a idea of how it will look on your 2015. I am very pleased with the speed at which my order was put together. I ordered the cargo carrier product on Tuesday morning and it was on my doorstep by Thursday afternoon - and this was the free shipping method. Overall, the priduct is rigid, and appears to be able to do the job nicely.